Today I am reporting from the beach, approximately 450 miles from anything related to the One Room Challenge. The week-long break has been gloriously refreshing for my mind, body and soul. But you didn’t come here to read about my mental state of being, so let’s talk decorating. As promised, today I’m sharing a few of the items that have already arrived. 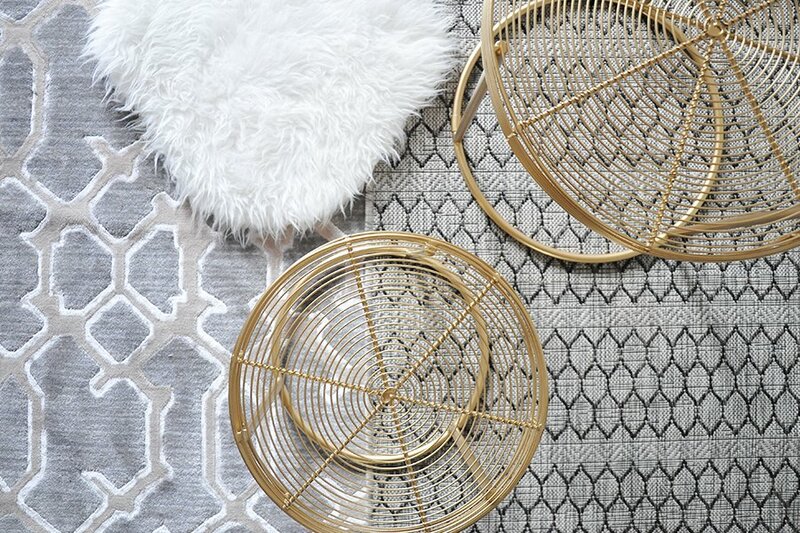 I’m also showing you how I shop my own home to stay within our decorating budget. As exciting as it is to buy all-new furniture, budgets have an interesting way of dashing our dreams and bringing us down to reality. The concept of shopping your own home isn’t anything new, but it’s something we often forget to do. Throughout the challenge, as I purchase more and more items for the living room, I am overwhelmed by just how quickly it all adds up. What’s more, going out and buying all-new furniture at one time isn’t the decorating approach I prefer to take. Design is a gradual, evolutionary process that often lasts a lifetime. When you try to rush the process, you typically end up with a room full of pretty but uninspiring objects that say nothing of the people that live there. And so I turned to shopping what we already owned, hoping to find a few treasures that could help bring my vision to fruition. Without further ado, here’s what’s new in our living room. Generously gifted to us by PureModern, this chandelier is one of the most controversial lighting fixtures in our house. The modern design is so uncommon around our remote little town, that it’s usually the first item visitors comment on. I’m excited to play up the style with a traditional Chesterfield sofa – if the latter ever arrives. With 24 bulbs at 25 watts each, the chandelier providers more than enough light. In fact, I can’t wait to put that baby on a dimmer so I don’t feel like I’m entering an interrogation room every evening. But after explaining how having only one source of light in a room is, quite possibly, the biggest design sin EVER, I convinced the husband that I was simply fulfilling my moral duty as a design blogger. If you’d like to add additional layers of light to a room, these floor lamps are currently 25% off! Get them while you can! At first glance, purchasing a record player may seem like a desperate attempt to appear hip. That, ladies and gentlemen, couldn’t be farther from the truth. I’m (already) so hip that I typed this blog post on a retro typewriter. If that’s not hip enough, then I don’t know what is. For the record, yes, we really do own a typewriter. If you’ve spent any time reading through this blog, you’re likely aware of my affinity for round, brass mirrors. When I first laid my eyes on this here goodness on Target’s website, it was out of stock in every store within a 200-mile radius. So I waited. And I waited, and I waited, and I waited. Then two of my friends were going on vacation down to Daytona, and I had the marvelous idea to check if Daytona’s Target had these mirrors in stock. Lo and behold, it did, and the rest, as they say, is history. 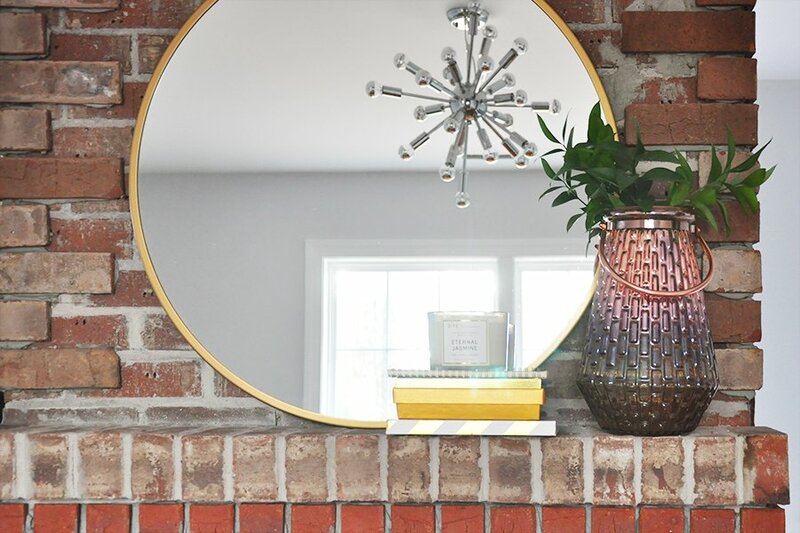 Two weeks later, our own Target re-stocked these mirrors AND marked them 40% off (what?! ), so now I am the proud owner of four round, brass mirrors. By the way, they are currently 10% off, so you better stock up! This next item is a perfect example of how to shop your own home. Once upon a time, Wayfair sent us two poppy red nesting tables for a “Pop of Color” campaign that I was taking part in. As much as I liked the bright and happy color in our previous two homes, I wanted an edgier, more sophisticated color palette this time around. I’m still uncertain whether to use these as side tables or as plant stands, but I’ll make that call if and when I actually source some plants! Continuing the gold theme, I went through a difficult time in my life where everything within 20 feet of me fell victim to my spray painting addiction. Vases, bowls, tables, random decorative objects – it didn’t matter. What mattered was that yet another object was saved from a dull and purposeless life with the help of a little spray paint. 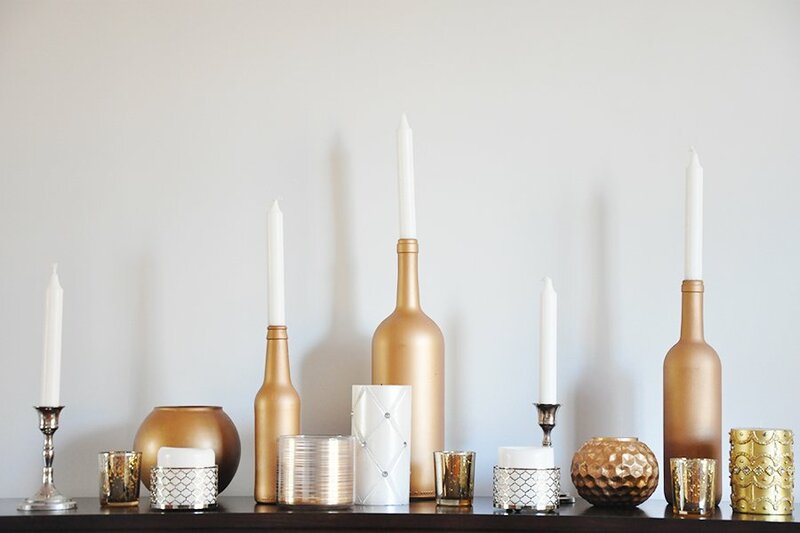 Needless to say, I have quite the collection of random gold objects, like these wine-bottles-turned-candle-holders. While they weren’t initially part of my design plan from week 2 of the One Room Challenge, it recently dawned on me that they’d look amazing displayed atop the mantle of our all-white brick fireplace – if we ever get around to finishing it. Yet another item I found from shopping my own home is this console table. 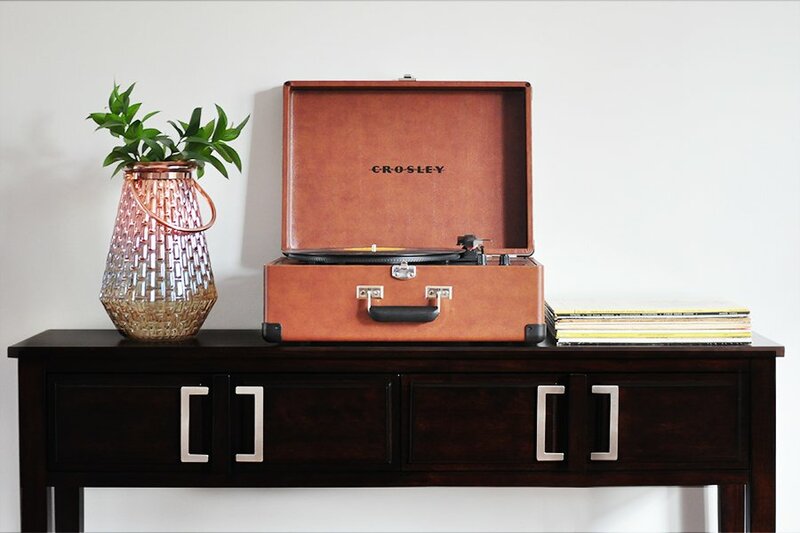 I originally planned to use it in the entryway, then briefly considered it for the dining room – only to realize it’d be perfect for holding the record player in the living room. The only dilemma is that I am not a fan of the dark, cherry-red color. Should I paint it black for a dose of masculinity in what is turning out to be quite a feminine living room? How about painting it gray to keep with the ‘fifty shades of gray’ theme of the whole house? Or what about white – because, well, you can never go wrong with white? Well, we’re planning to make a run by IKEA on our way back from vacation, so I should have more updates for you next week. The first project we’ll tackle when we get back will be the fireplace makeover. Also hoping to have updates on the sofa and the gallery wall soon. I still have to find club chairs that aren’t $1,000 each, like the ones I used in the room mockup… I did find a pair on Amazon that wasn’t as expensive; they were upholstered in a cream, velvet fabric and had exposed chrome frames, but while reading the product description, the price jumped nearly $75 on each chair, so now I sit here waiting for it to (hopefully) go down. If you want to follow the ORC more closely, come join me on Instagram and Snapchat for a peek behind the scenes; this week I’ve been sharing a tour of the condo we’re renting for the week; it’s giving me all sorts of inspiration for the One Room Challenge. 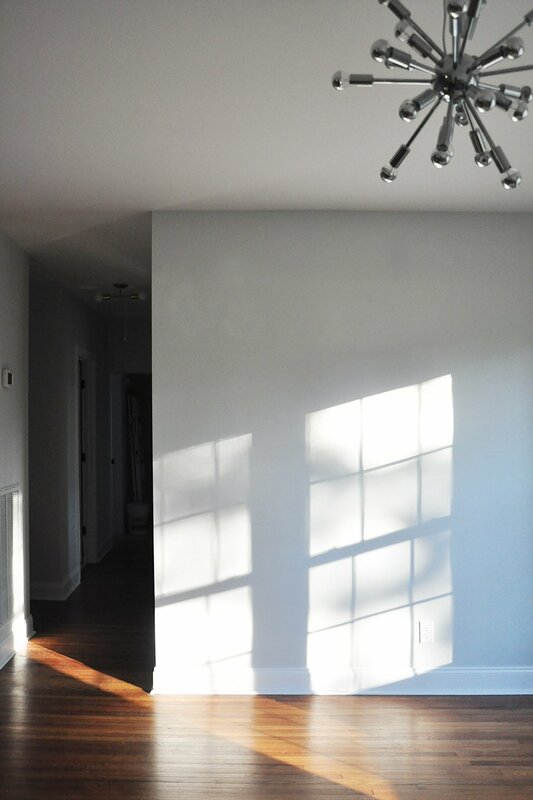 To catch up on what we’ve renovated so far, browse the full “Our Bungalow Renovation” series. To see how the other 220+ bloggers are progressing on their room transformations, check out the “One Room Challenge” linkup. Huge thank you to sponsors PureModern for gifting us the “Sol” chandelier and to framed & matted for providing the custom frames for this project. Posted in HOME DECOR, OUR BUNGALOW RENOVATION and tagged LIVING ROOM, ONE ROOM CHALLENGE. You’ve done a great job of shopping your house! And I fully support the need for a record player… in fact, I might even be able to out-hip you, because we have a 1955 jukebox in our living room ;) Music always sounds better on a record! Oksana! There is so much to love here! I am crazy for the brass floor lamps and I picked the same mirror for my ORC. Isn’t it fabulous? Omg! All of these items are absolutely gorgeous. Definitely using this post for some inspo. 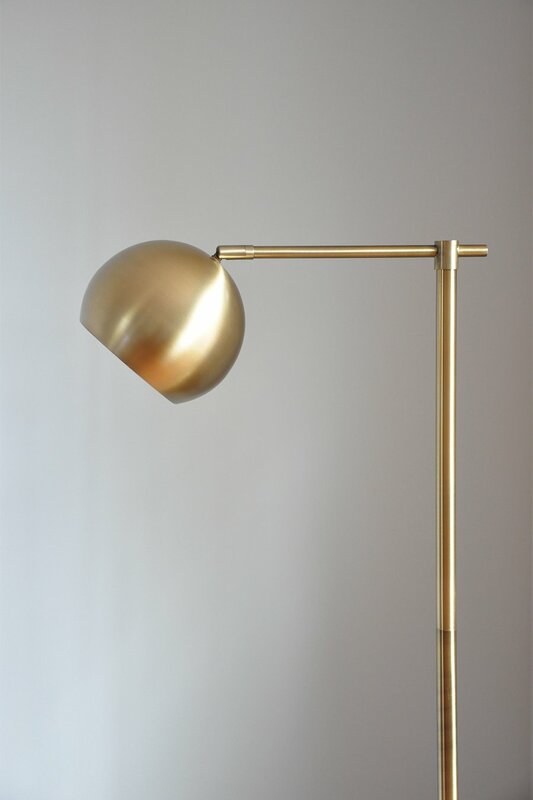 I actually just bought that gold lamp from Target as well! I LOVE all the products you’ve chosen and that sputnik is amazing! Sputnik light fixtures are my favorite and I wanted one in my dining so bad but when we were building I couldn’t source on for less than $3K dollars so I gave up. Loving everything girl and can’t wait to see this reveal!! I’ve been dying for a record player! I think it brings a lot of life to the room and it can be a great decor piece, too! I am loving all your choices! And that brass! Hope you were able to disconnect before coming back and continuing to tackle; it’s going to be so so good!! I love the pieces that you’ve picked up so far! 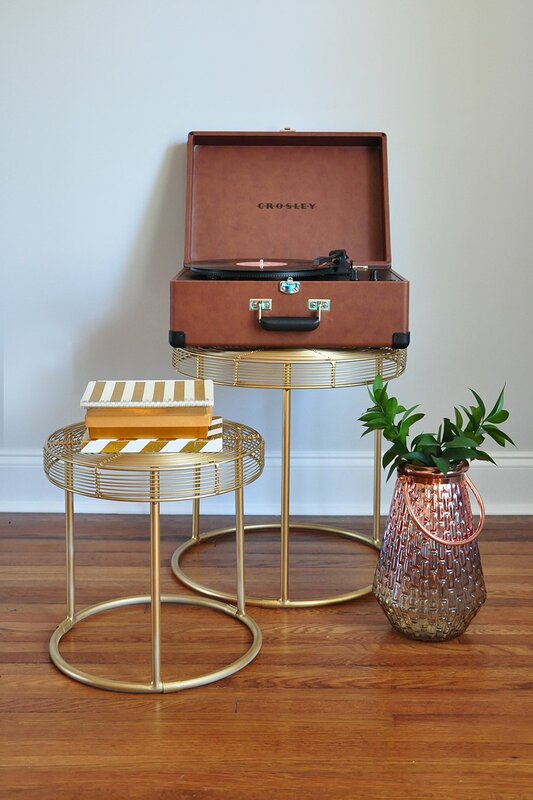 I especially love the brass vase that you showed in the photo with the record player. Seriously, I want to put it on a dining room table as a centerpiece – stunning. love the chandelier and gold nesting tables! I loooove seeing the transformation of your room. It is so exciting! We have been trying to furnish and decorate our new house, but it is EXPENSIVE! I love love these pieces! The one room challenge is so cooL! when your done redoing your house, you should come do mine lol!!! everything looks so good. I am in love with everything. I am in love with all of these goods. Stunning lamp and record player. I’m in need of a new record player! I think record players are making a comeback – my roommate has a record player and buys vinyls of Adele, Taylor Swift, and Justin Bieber! I love the retro look, and I think the chandelier is beautiful! Can’t wait to see how you pull everything together. How did we not know each other before this? I think you are my decor soulmate. I used that Target lamp in our bedroom, but since then it’s been in the living room, which desperately needed a lamp. I love it! I’ve wanted a pair of those round gold mirrors forever for our master bathroom. I’ve even got a similar collection of random objects spray painted gold. But my favorite is the pairing of the sputnik with the chesterfield. It’s going to be so good! Modern pieces mixed with traditional gives me happy heart eyes! Hope you are enjoying your vacation! That light is amaze-balls!! Can’t wait to see the finished product! I love all the brass and gold details you’re adding in! The room is going to look so good when it’s complete!! Love the round brass mirrors! I really need to go to Target for home decor more often. They have great deals! Love this space! Love the bureau with the record player on top. I’m so glad that you guys are having fun on your vacay! love your thinking on lighting! ha! can’t wait to see what next week brings!! I ADORE the brass touches! so gorgeous! And the record player is so cool! Enjoy your vacation!! way to be patient and score that mirror! i love it!